The deceptively adorable sisters get stylized with Funko Pop Powerpuff Girls figures. Along with the title characters, the set also features supervillains from the animated series. The Powerpuff Girls debuted in 1998 on the Cartoon Network and ran for six seasons. The show follows the lives of three girls—Blossom, Bubbles and Buttercup—who were accidentally given superpowers when Professor Utonium attempted to create the perfect girls. Ultimately, the trio is constantly saving their city from a wide array of criminals and monsters. 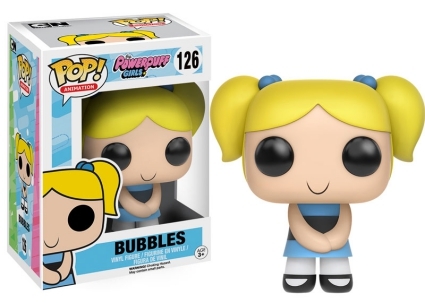 Funko Pop Powerpuff Girls captures the unique look of the sisters including their over-sized eyes. Wearing her pink dress, Blossom's long red hair is seen well below her waist, resting right at the back of her feet. 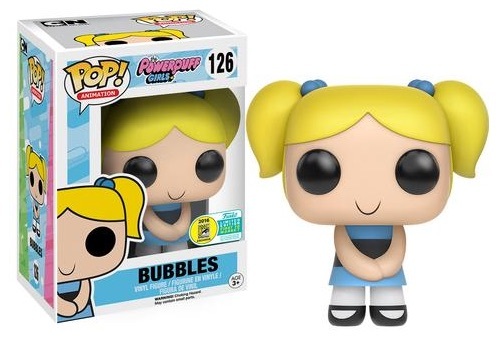 Bubbles is shown with her blonde hair in pigtails and blue hair ties to match her dress. 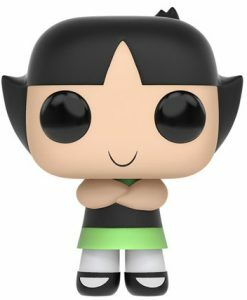 Although she wears a green dress, Buttercup is considered a tomboy and the toughest among the sisters. Echoing this, her figure features crossed arms. 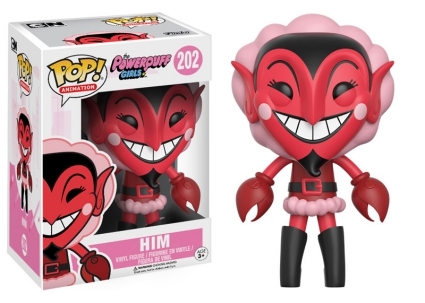 Each of the Powerpuff Girls also has a "first to market" exclusive found at 2016 San Diego Comic-Con and other '16 summer conventions as well as Hot Topic. 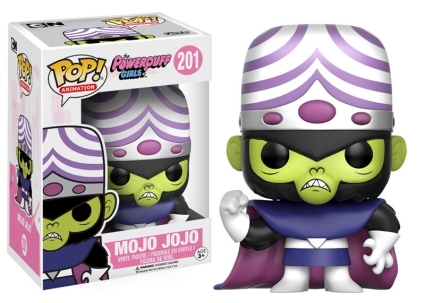 Additionally, Funko Pop Powerpuff Girls vinyl figures include the evil genius chimpanzee, Mojo Jojo. He is wearing his dark cape along with a purple-and-white striped turban, and his green skin is visible despite black facial hair. Lastly, options for the King of Darkness, a.k.a. HIM, include the main figure while the glow-in-the-dark chase variant naturally glows red. Part of the Pop! 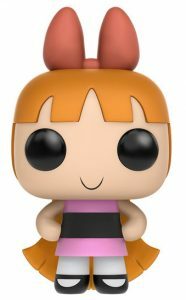 Animation box numbering, the Funko Pop Powerpuff Girls figures stand approximately 3 3/4" tall. 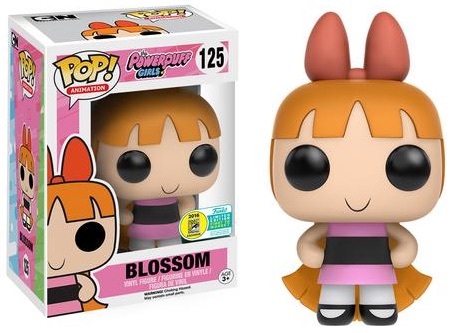 However, Blossom appears slightly taller than the other girls due to the bow in her hair. 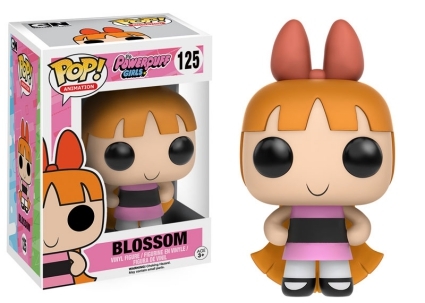 Funko POP Powerpuff Girls Blossom #125 vinyl figure Brand New in Box! 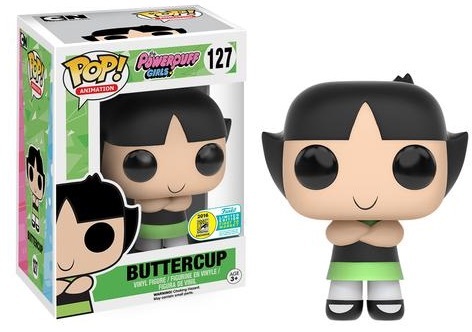 What’s the difference between Powerpuff girls #127 buttercup pink box vs green box? 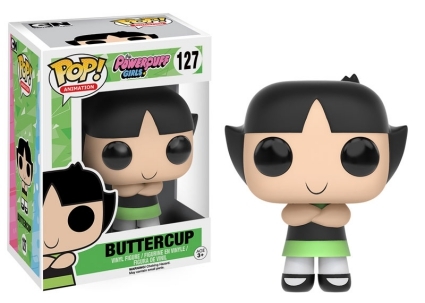 William, Buttercup with the green box is a pre-release from the 2016 San Diego Comic-Con, while the entire main set is issued in pink boxes.